Please note: The deadline for Seniors to submit revised letters of intent is October 1, 2018. Late letters will receive a 10% deduction. Marquis Garden Place – Volunteers needed to help residents with Activities. Contact: Adam Burda at ABurda@enlivant.com. Be My Neighbor Day: Saturday April 13, 2019. Mountain Watershed Association: This group hosts river clean-ups and other events to promote and protect Ohiopyle. Jr. Red Raiders Cheerleaders – Contact Jamie Bombach if you'd like to help with practices and games for the upcoming football season. Home for the Holidays – Volunteers needed for annual Holiday Kick-Off in Downtown Uniontown November 30 – Dec. 3. 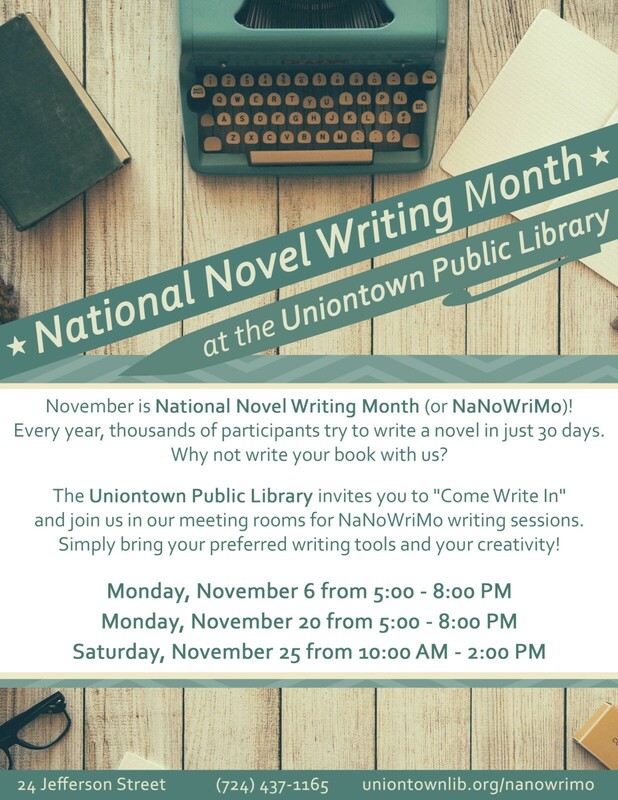 Aspiring Writers: Begin your novel during National Novel Writing Month at the Uniontown Public Library! PA School for Global Entrepreneurship – This four week program takes place at Lehigh University and its designed to inspire the spirit of entrepreneurship and expose students to effective business practices. Apply online by February 15, 2017. Special Olympics of Fayette County is accepting volunteers. Sporting events are held throughout the year and various locations in the county, but swimming, track and field take place here at UHS! See. Mrs. Colebank for more info! East End United Community Center – Make a difference by volunteering to help our youth and senior citizens. Fill out volunteer application. Big Brothers / Big Sisters – This is program pairs Little Raiders with Big Raiders…. High Schools would mentor elementary students from Lafayette. Download Big Brother Big Sister Application. Big brothers big sisters reference Big Brother Big Sister Interests NEW SBM BROCHURE (1) See Mrs. Baker for more details. New Salem Presbyterian Church – accepts volunteers for monthly food pantries. Henry Clay Villa – Offers short term and skilled nursing long term living. Contact Mr. Taylor at 724-329-5545 ext. 3452 if you're interested in volunteering. Uniontown Concerned Citizens – this new organization is a collaboration of citizens from East End, Gallatin Avenue and Lafayette areas. This is a great opportunity for young adults to work with community leaders to help make a difference. The group meets on the last Thursday of each month at the East End Community Center. The Phoenix Arts Center – register to take a class or become a volunteer! Uniontown Hospital – See Mrs. for an application or download at www.uniontownhospital.com Check back for details on a 2018 Open House event . Penn State Extension – this agency offers several volunteer and educational opportunities throughout Fayette County.